2019 Original Cowpokes Calendars by Ace Reid are selling out! Put your order in today for this traditional favorite! The 2019 Cowpokes Calendars are here! 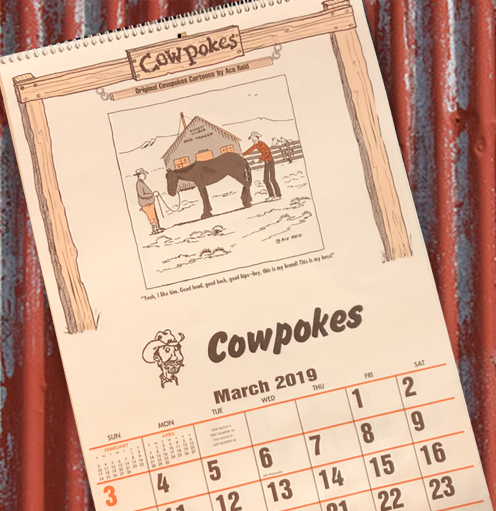 Cowpokes Calendar 2019 is the one and only, the original, calendar for Cowpokes by Ace Reid! Every year the Cowpokes calendar comes to you with 12 different side splittin’ cartoons for cowpokes everywhere. Give yourself lots of laughs throughout the year! How about giving a few friends a whole bunch of laughs as well? The giving of Cowpokes calendars is a tradition of cowboys and cowgirls world-wide! We sell out of these collector’s items, the 2019 Cowpokes Calendars, so order yours now! You can also special order Cowpokes calendars and have them personalized for fun, gifts or advertisements. Contact us today for more information. 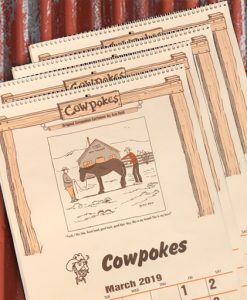 2019 Cowpokes Calendar Bundle of 10 – Get 2 Free! 2019 Cowpokes Calendar Bundle of 4 – Get 1 Free! 2019 Cowpokes Calendar Bundle of 20 – Get 5 Free!